The BBC is getting into the hardware hacking craze with its second device aimed at school age children in the last 34 years. The British broadcaster recently unveiled the Micro:bit, a mini-programmable computer meant to teach children how to code and develop hardware projects. The device will be given away to every child in Year 7 at schools in the U.K.—around one million students—beginning in October. Before the end of the year, the device will also be available for sale to customers in the U.K. and other points around the globe. Presumably that includes the U.S. Unlike other popular boards such as the Raspberry Pi, the Micro:bit is not meant to be used as a standalone PC. Instead, it’s a basic board for embedded projects such as a gaming device or a remote control. 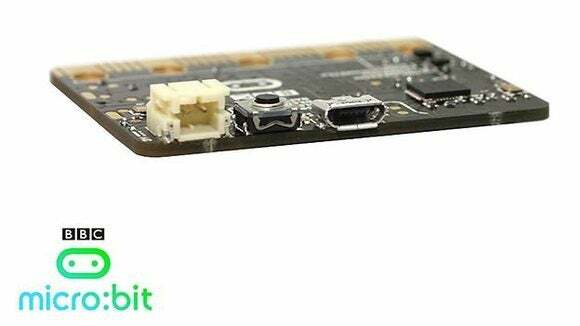 It’s also compatible with more advanced micro PCs like the Raspberry Pi and Arduino boards for projects that require more processing heft. 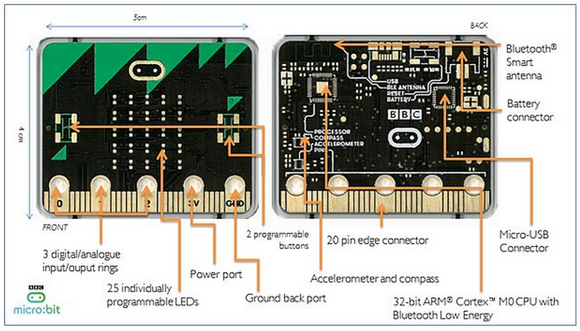 The 1.6-inch by 2-inch Micro:bit comes with a 32-bit ARM Cortex M0 processor, 25 programmable LED lights arranged in a grid, two push buttons for user input, an accelerometer and compass, a micro-USB connector, and Bluetooth. The device was originally supposed to come with a slot for a watch battery, but the final design cut that, opting for a battery pack add-on instead that takes two AA batteries. You can find complete specs on the BBC’s website. The Micro:bit is a huge collaboration between numerous tech companies including ARM, element14 (sellers of the Raspberry Pi), Microsoft, and Samsung. Why this matters: A recurring debate in the tech world is whether there’s any sense in teaching children to program. Some argue that programming is hard and, just as not everyone needs to know how to fix a car, not everyone needs to know how to program. But with computers becoming central to pretty much everything there is value in learning some coding basics. Most of us remember enough from math class to know you have to multiply before you add. Similarly, a familiarity with how code works and a coding mentality to problem solving can go a long way in a technology-driven world. The Micro:bit is the BBC’s second run at sparking the interest of students in computing. In 1981, the BBC worked with Acorn Computers to produce the BBC Microcomputer System (BBC Micro) sold primarily to schools in the UK as part of the BBC’s Computer Literacy Project. The device was similar in form to a Commodore 64, a non-descript beige box with a keyboard that hooked up to a monitor or television. Unlike the previous computer project, the Micro:bit will be distributed to individual students thanks to the ever lowering cost of components. It will also be 18 times faster at running code, 70 times smaller, and 617 times lighter than its predecessor, the BBC says.